Australia prides itself on being a giving nation. But would you give unconditionally to a homeless person and be okay with not knowing what your money was spent on? Would you give $5 to a homeless person and not care how they spend it? “’I’ll give someone a sandwich but I won’t give them money because they will spend it on drugs,’” is a comment Donna Stolzenberg, founder and director of Melbourne Homeless Collective, hears often. Stolzenberg believes that most Australians have been conditioned to believe that drugs and alcohol abuse cause homelessness but this statement couldn’t be further from the truth. Although statistics vary, she estimates that – on average— only one-in-10 homeless people face dire straits because of substance abuse issues. We treat them like infants. Before rising to fame and riches, some of the world’s best known celebrities were homeless. It’s this sense of responsibility that drives many of us to make decisions on behalf of the homeless without any consideration for what the person we’re giving to needs. While we consider other peoples’ dietary requirements - nut allergies, diabetes and halal food - in normal social settings, when it comes to the homeless it’s uncommon to ask people without a permanent home what they actually need: instead, we just buy food and give it to them without thinking “can this person even eat pork?” she adds. The conditions we have around giving to the homeless extend to the charities themselves, affecting how they can raise money. “It can be a positive thing to say, in effect, ‘here’s some assistance – and it’s up to you to make best use of it,’” says Attwood. The belief that “beggars can’t be choosers” is still one of the underlying motivators driving Australia’s giving. CEO of Council to Homeless Persons and Chair of Homelessness Australia, Jenny Smith, says while we like to believe we are a giving culture, in reality, we are more of a fair-go culture. Our human and health services are based on the British system but as we’ve adopted more of the United States model in recent years, our safety net has shrunk. “We have this idea that we have a good safety net so we believe that people bring miseries upon themselves rather than focusing on the economic situation that is the driver,” says Smith. English paramedic Fay Sibley has given the coat off her back, and is encouraging others to do the same. Fundraising by not-for-profits and social services is needed to allow the sector to try new ideas and be innovative but it should always be the “extra bit on top,” says Smith. She also believes it’s the government’s responsibility to provide a social services safety net to catch people when times get rough. ...most Australians expect people experiencing homelessness to qualify for assistance and prefer they have little control over what type of assistance they receive, reducing them to passive recipients. Stolzenberg warns that if we continue to give to vulnerable members of our society with conditions attached, we may be in danger of preventing the people who need our help the most to access it. If this article has raised issues for you and you would like to talk to someone, please call Lifeline on 13 11 14 or visit their website by clicking here. For information about services from St Vincent De Paul, click here or for services offered by Salvation Army, click here. 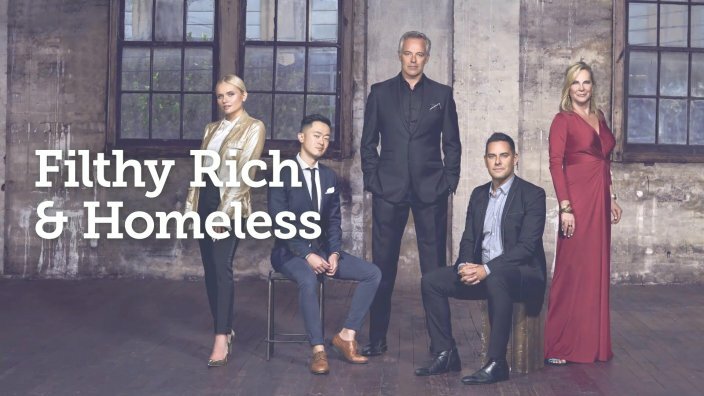 Filthy Rich & Homeless season 2 airs over three nights starting on Tuesday 14 August 8.30pm on SBS. You can also stream the show anytime on SBS On Demand. Join the conversation with #FilthyRichHomeless. Parental separation substantially raises the risk of homelessness by the age of 30 for girls and boys, but only boys are affected by a break-up after the age of 12. It really could happen to you. But do you have the skills and knowledge needed to make it through life without a permanent home? Housing may be a human right but right now, there are over 110,000 people without a permanent place to call home in Australia. Dr Catherine Robinson uncovers the 'other' very real and urgent housing crisis.